Put those hard to reach items in your Blind Corner Cabinet right at your fingertips with this Half Round Glide Out 2-Shelf Lazy Susan by Knape & Vogt. It is a truly hassle free way to store your kitchen items. 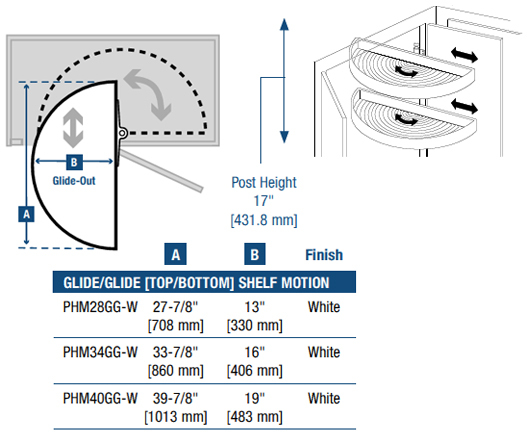 The Glide-Out Half-Moon Shelves incorporate a heavy-duty ball-bearing slide for easier access to cabinets. Both Slide Mounted shelves pivot out of blind corner cabinets and extends 11 3/4" on quiet, ball-bearing slides. The Textured Shelves includes 1-1/2" high rim to help hold tall items upright. 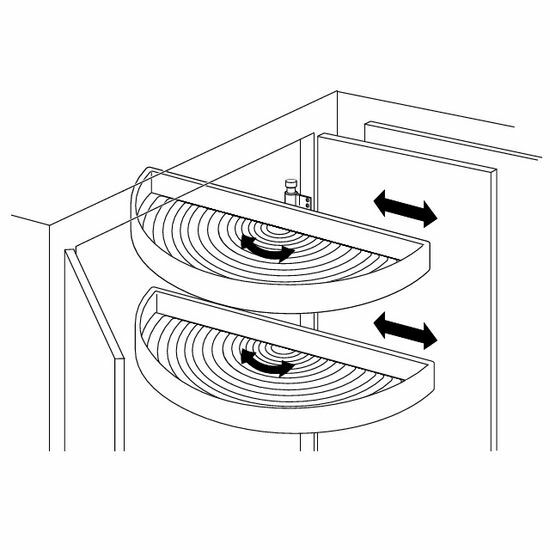 This Glide Out Lazy Susan has a Reversible Design for either right or left hand cabinets. This unit is available in multiple sizes to fit any Blind Corner Cabinet. Model KV-PHM28-GG-W (27-7/8� Diameter) requires a cabinet depth of approximately 14�. The image under the Dimensions section should give you a clear picture of the required cabinet dimensions. For safety, add an inch to �A� and �B� for door opening and cabinet depth respectively.